Getting a student’s name right is the first step in welcoming him or her to school. Staff members who work with student-level data also know the importance of accurately and consistently recording a student’s name. This makes it easier to track student data over time, match files across data sets, and to make meaning from the data. For the past 10 years, English Language Learners (ELLs) have been one of the fastest growing student subgroups in the U.S. Many teachers feel unprepared to work with these students. The following article has tips for classroom teachers with ELLs this year. Despite the fact that English-language learners (ELLs) and immigrant students have been the fastest growing student subgroup in the United States for the past 10 years, teachers continue to report that they feel unprepared to work with students who are language learners. Professional development for reaching ELLs seems, at best, a one-shot deal, even though ELL enrollment continues to increase annually in most states. If you would like to be added to our distribution list, fill out the form on our website. Please be sure to add us to your address list to make sure you are receiving our eNews. CR Part 154 now requires educators of ELLs to work collaboratively with other teachers, something known to be a critical need. It has also been recognized as an essential component for positive change for the instruction and academic progress of English learners. This workshop will help participants develop or enhance instructional and leadership skills necessary to successfully implement the Integrated ENL requirement of the CR Part 154. The first focus group for the 2016-2017 school year will focus on literacy for English Language Learners. This focus group will be conducted as a book study on a few select chapters of: Literacy Instruction for English Language Learners. All participants will receive this book prior to the focus group meeting. Registration information coming soon. This two-day conference is designed for ESOL and content teacher partnerships and presented by Questar III ELA Specialist Sandy Strock and RBERN Resource Specialist Jessa Waterhouse. Day 1 will delve into the processes of co-planning and co-teaching in a classroom that includes English Language Learners. Presenters will explore different strategies and scaffolds teachers can use with a classroom of varying language proficiency levels to increase content area literacy. Day 2 Presenters will facilitate participants’ development of an integrated unit, including scaffolds and strategies from day 1. By the end of day two teacher teams will walk away with a unit frame, several strategies to use in a classroom with varying language proficiency levels, and the beginnings of daily lesson plans, as well as a process for collaboration and co-teaching. Registration information coming soon. *As a reminder please note that all RBERN sponsored events are free of charge. Using a wealth of classroom anecdotes, student samples and specific teaching language, Mermelstein will illustrate how even the youngest students can become self-directed learners. Her explicit strategies include creating an appropriate physical environment along with daily rituals and routines, scaffolding instruction with Write-Alouds and Interactive Writing and planning units, focus lessons, strategies for conferring with students, and shares that are aimed at helping kids become self-directed. Click here for more information. Click here to register. Participants will explore a progression of visual models and algorithms that gives students a deeper, more connected understanding of numbers, operations, and word problems. The goal is for participants to be more excited and better prepared than ever to start the new school year. Click here for more information. Click here to register. This workshop on the Units of Study in Opinion/Argument, Information, and Narrative Writing, K–5, will explain all the teaching points, mini-lessons, conferences, and small group work needed to teach a comprehensive workshop curriculum in opinion/argument, information, and narrative writing, foster high-level thinking through regular chances to synthesize, analyze, and critique, build writing independence and fluency, provide a ladder of exemplar texts that model writing progressions across grades K–5, develop and refine strategies for writing across the curriculum and include strategic performance assessments to help monitor mastery and differentiate instruction. Click here for more information. Click here to register for grades K – 2. Click here to register for grades 3 – 5. The Hudson Area Library is hosting a free adult Spanish Language class every Tuesday from 6:15 – 7:15. You do not have to attend previous sessions to join. The Hudson Area Library is located at 51 N. 5th Street, Hudson NY 12534. The Hudson Area Library is hosting a class for Literacy skills practice for youth ages 2 and up to improve their English language abilities. Free English classes are available at the Hudson Area Library for adults who want to improve their reading, writing, and English speaking skills. Free child care is available to children of registered students. For more information contact Literacy Connections at 518-697-8227 or stop by their office on the 2nd floor of the library during office hours (Tuesday-Friday 10am-5pm). SUNY Oneonta Online Bilingual Education Program – SUNY Oneonta is offering a new tuition assisted Online Bilingual Education Extension Advanced Certificate Program. This online program which consists of five graduate level courses, is tuition assisted for qualified students by the New York State Office of Bilingual Education and World Languages. Click here for more information. SUNY New Paltz Clinically Rich Teacher Institute – Are you interested in studying to receive your certification in English for Speakers of Other Languages (ESOL)? SUNY New Paltz will begin classes for two cohorts of participants in May and September. Click here for more information. Looking for Scholarships? The Hispanic Scholarship Fund has many programs and resources for Latino students. Click here for more information. Are you a Spanish Teacher? Instituto Cervantes offers a variety of courses for teachers as well as scholarships. Click here for more information. Looking to volunteer? Literacy Volunteers of Rensselaer County is looking for volunteers. This organization teaches people of all ages to read, write and speak English. Click here for more information. Volunteers Needed - YOUTH POWER!’s Ready to Achieve Mentoring Program (RAMP) is looking for volunteers for their high-tech, career-focused mentoring program. RAMP serves youths with disabilities ages 11-17 who are at risk of entering the juvenile justice system. Volunteers will mentor youths about job options and how to set goals. Click here for more information. 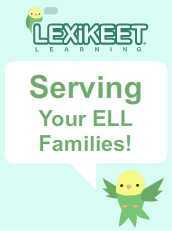 ELA Glossaries (grades 3-8) are now available thanks to the NYS Satewide Language RBE-RN. They are available in: Arabic, Bengali, Chinese (Simplified & Traditional), French, Haitian, Hindi, Karen, Korean, Nepali, Punjabi, Russian, Somali, Spanish, Swahili, Ukrainian, Uzbek and Vietnamese. Looking to learn a new language? Click the icon below for information on the language learning software company Lexikeet. They offer more than just language learning! Are you looking for bilingual word-to-word dictionaries? Attanasio & Associates offer these dictionaries in many different languages. Click here for more information. Are you looking for Spanish Language materials? Scholastic has released their 2016 Spanish Product Guide. Click here for more information. NYSUT has partnered with Mercy College to make it easier for teachers to pursue NYS TESOL and Bilingual certification. Click here for more info. Should you have any questions related to English language learners, please do not hesitate to contact the RBERN. Copyright © 2016 Regional Bilingual Education Resource Network, All rights reserved.